STEVENS FOR ALTUVE! (Thats new Astro Bob Stevens modeling his 2013 road jersey for the news conference at MMP.)   Houston Babies GM Bill McCurdy announced today that star right fielder Bob Stevens and a bag of vintage base balls had been traded to the Houston Astros for rookie 2nd baseman Jose Altuve and a written SABR report by some literate member of the Astros staff on a baseball book to be named later. Babies Manager Bob Dorrill expressed both his gratitude and regret. The Babies are happy to get Altuve, Dorrill said, but we really are going to miss Bob Stevens and his rifle-arm in right next Babies vintage ball season.. It didnt really happen. What really happened Monday night was that SABR/Houston Babies member/right fielder Bob Stevens established himself as the first and only person, so far, to wear any of the new Houston Astros 2013 uniform gear to the November 2012 SABR meeting at the Inn at the Ballpark next to Minute Maid Park. 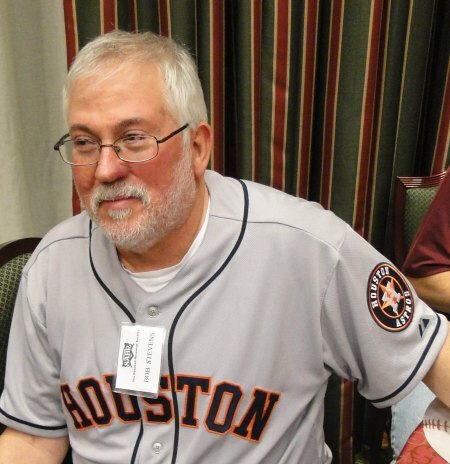 Bob wore a 2013 Houston Astros road jersey through the door and, in his usual quiet and reserved style, he took his seat in a far corner table and allowed his jersey to speak for him. 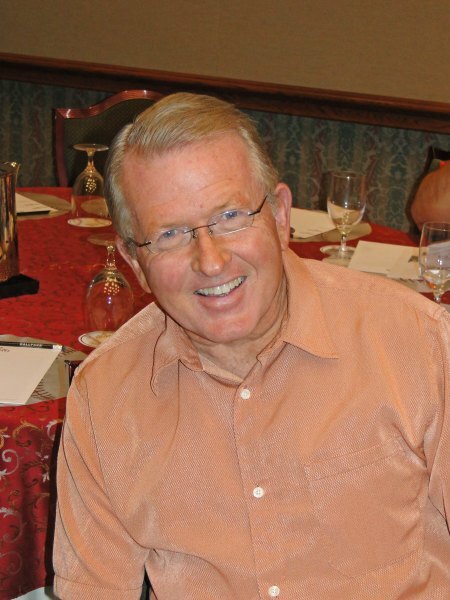 Bob Stevens is not your everyday run-of-the-mill runway clothing model. It was all I could do to get him to turn around for a couple of photos. But, in his equally common courteous way, he managed to pivot in his chair long enough to allow two good shots of a good-looking SABR/Babies guy dressed as an Astro. The trade ruse here simply jumped into my mind as an early morning curve ball from this columns ethereal muses as an alternative to my intended opener Last night we held our November 2013 SABR meeting downtown as the Larry Dierker Chapter in Houston, which is really todays article subject. So, dont worry. The Houston Babies will not have to contend with a barehanded second baseman named Jose Altuve in 2013  and they hold on to their rocket-armed and fiercely quick right fielder that is Bob Stevens. Astros television analyst and former big league pitcher Steve Sparks delivered a talk that was equivalently informative, instructive, entertaining and funny. Steves minor league time in Stockton even carried him through a short period of service with the Mudville Nine, old Caseys outfit. 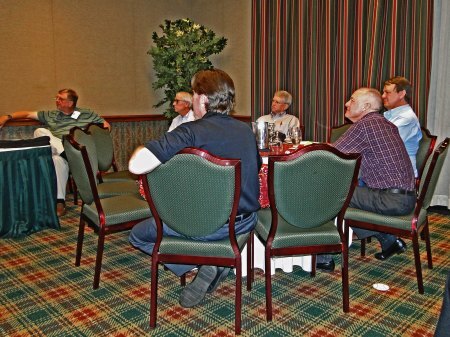 As per usual, we have SABR Chapter leader Bob Dorrill to thank for corralling the best available baseball talent in our area to speak at our monthly chapter meetings. Those of you who dont attend must not realize how much GREAT baseball talk you are missing. Tony Cavender presented a humorous book report on a large work that detailed some of the funniest things that baseball players do and say to each other, among other things. One of the stories involved some language a player was using to describe a devilish curve ball, but Gentleman Tony was having trouble telling the tale because of the vulgarity. When we discussed the dilemma prior to the meeting at dinner. I suggested that Tony simply call it a mofo curve because I was sure that most would know what he really meant. Tony ran with that one  and guess what?  Everybody got it.  Thanks, Tony, for a great total review. 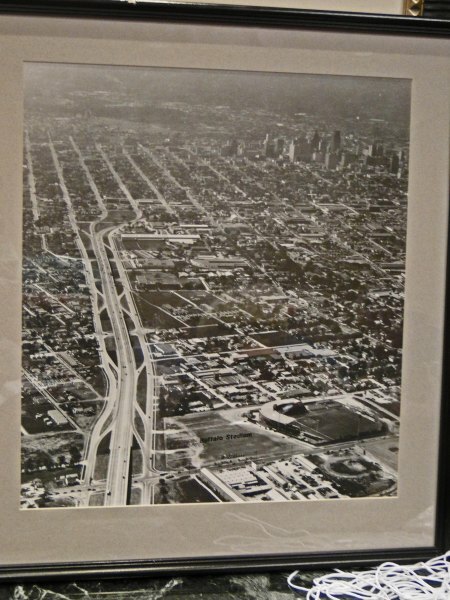 Jo Russell brought a framed aerial photo of Buff Stadium, looking west toward downtown from the Gulf Freeway. It was done by the Bob Bailey Studio in the early 1950s and it is not the one from the late 1930s that also contains a look at old West End Park. Mike McCroskey did most of the narration on this one. 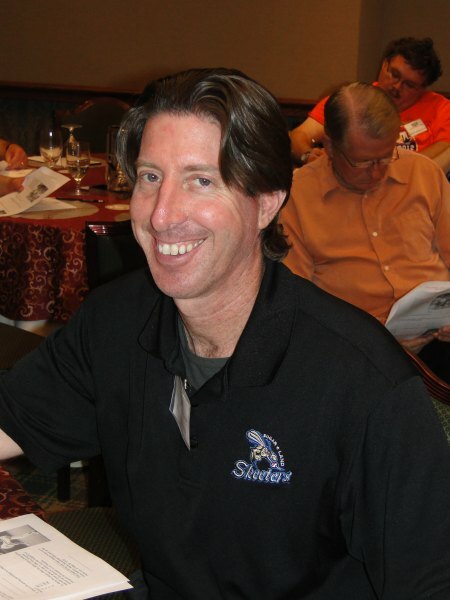 Ira Liebman, the Event Marketing Manager and Broadcaster for the Sugar Land Skeeters, was one of several visiting guests of SABR. Welcome, Ira! 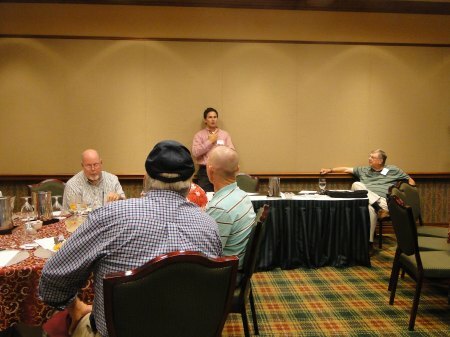 We shall hope to see you and all the others at further SABR meetings. Broadcaster Greg Lucas was among our regular chapter member folks on hand. Astros Radio Broadcasting Icon Bill Brown  and 25-30 of his friends  were also in the house Monday night. 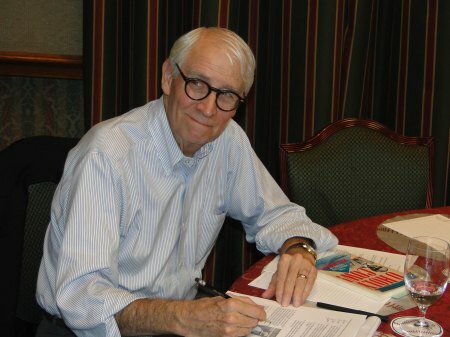 Bill also spoke to us about his new book on the history of the Astros, seeking, as good writers do, fresh perspective from SABR people on strategies for maximizing interest in the story and the book. 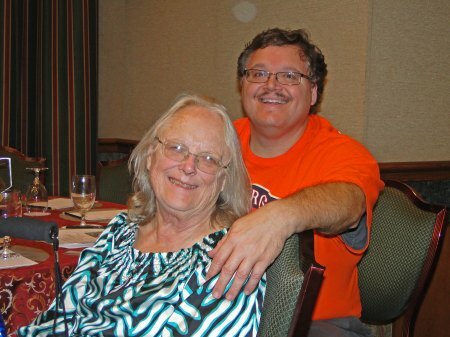 Loyal SABR member Matt Rejmaniak and his sweet mom were also there. 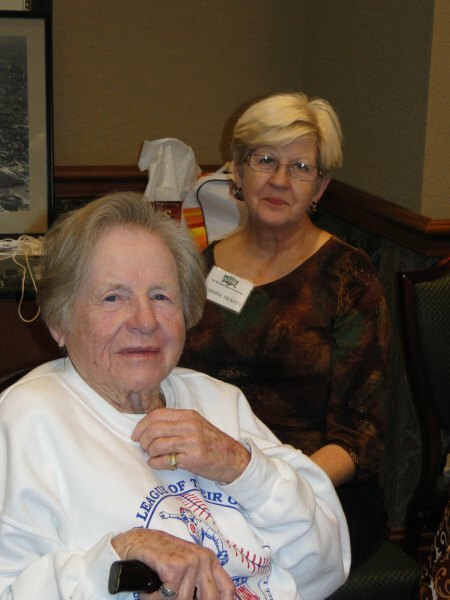 Former All American Girls Leaguer Marie Red Mahoney is now a new SABR member and was also there last night with new SABR friend Marsha Franty. 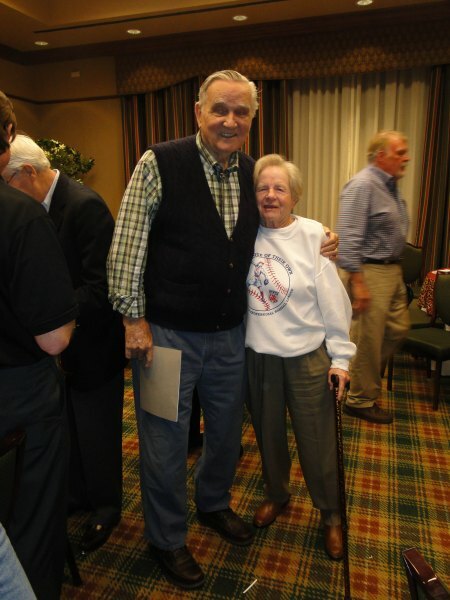 Larry Irish Miggins, 87, and Marie Red Mahoney, 88 are now our two SABR and Baseball History senior icons. Larry played in Jackie Robinsons first professional game as a member of organized baseball in 1946.  Marie was a charter member of the famous League of Their Own for women that began in the 1940s. 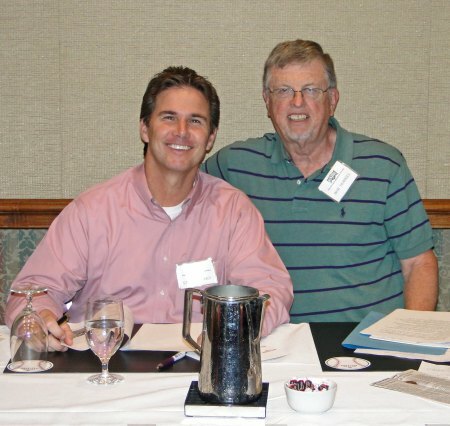 Both are deep baseball people  and both are now happy members of the Larry Dierker Chapter.  Join us sometime. 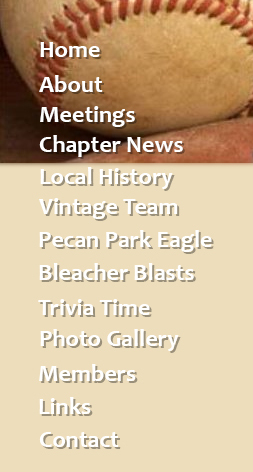 Our next meeting is set for 12/10/12. 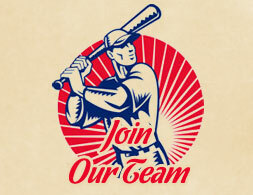 For further details, e-mail Bob Dorrill at BDorrill@aol.com  or call him at 281.361.7874. We would love to have you join us in our non-stop celebration of baseball and rich historical contributions to our culture and country.